â€¢ 10 different games to become a better musician and achieve high scores in grade theory exams: Higher Lower, Pitch Training, Interval Training, Chord Distinction, Scale Identification, Interval Comparison, Pitch Identification, Melodic Dictation, Chord Progression, Absolute Pitch. 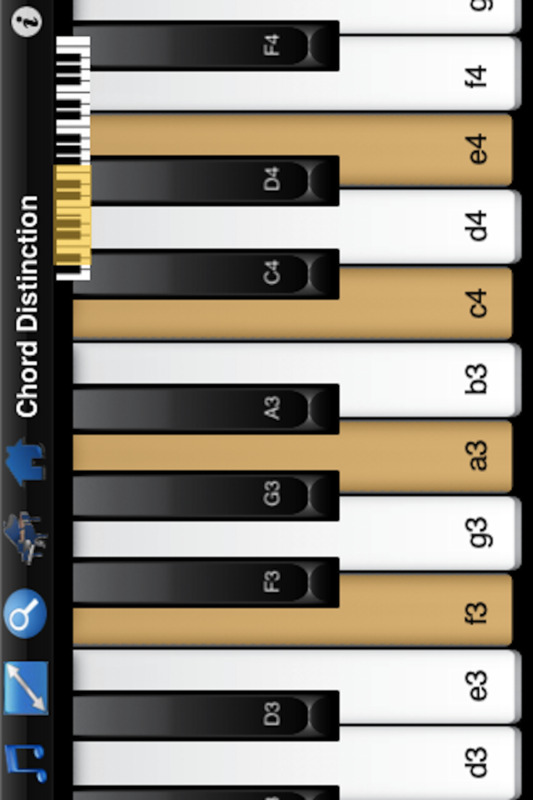 â€¢ Resizable piano suitable for all iphones and ipads. â€¢ Suitable for beginners to advanced musicians. Games have different levels and you can program and focus on specific chords, intervals, progressions, scales etc. Develop your skill to recognize different pitches. Given 2 notes, can you identify whether the second note is higher or lower in pitch than the first note? A beginners exercise. You can make the exercise more difficult by restricting the range of the 2 notes played. Given a single note, can you play it back? This exercise allows your to zoom in on the note using relative pitch skills, and will record how many notes it takes for you to correctly identify. Make this more difficult by setting a time interval between listening and playing. Given 2 notes, do you know how far apart they are? Being able to determine intervals between notes in the key skill to playing by ear. You can change the base note to interval train in any key. This is made easy as it associates an interval (e.g. Minor 2nd, Major 2nd, Minor 3rd, etc.) with a well known song. Select Song Clue to use a well known song as a learning aid to identify the intervals by ear. Can you distinguish a Major from a Minor for example? Select apreggio mode to make chord distinction easier. Select highlight to inspect the construction of the chords. You can change the key of the chord. Work your way through the levels. Breakdown of chords listed on Help page. Given 2 intervals, can you determine whether the second interval is wider or narrower in distance? A popular test that comes up in music grade aural exams. Given a chord can you identify a specific note/pitch within it? For example, given a C Major chord, can you find the highest note? Given a melody, can you play it back? Can you distinguish a I - IV - V - I progression from a I - V- IV - I? Contains all the most common chord progressions which you will find in nearly all the most popular songs. Given a scale, can you identify it as a Major scale, Harmonic Minor or Natural Minor for example? Can you identify the note without a reference tone?